NASA’s Opportunity Rover Sleeps on Mars « Adafruit Industries – Makers, hackers, artists, designers and engineers! On Mars, NASA’s Opportunity rover has run out of so much power it can’t communicate with Earth anymore — but that doesn’t mean the vehicle is dead yet. The robot is in a deep sleep, thanks to a particularly nasty dust storm that’s blocking sunlight from hitting its solar panels. NASA engineers are optimistic that the rover will be able to wake up and do science again once the storm has cleared up. But they’re still worried. The last time anyone heard from Opportunity was on the morning of June 10th, when it sent a radio transmission indicating that its energy production was at an all-time low. 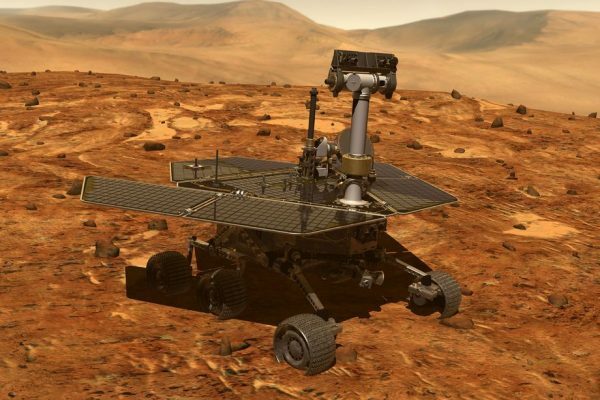 That prompted NASA to declare a “spacecraft emergency,” since Opportunity wasn’t generating enough power to continue doing its most basic functions. When NASA tried contacting Opportunity yesterday, June 12th, the rover didn’t reply. That means it’s gone into a very low power mode.